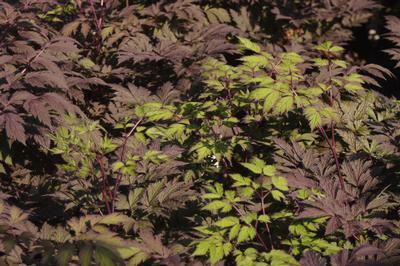 ‘Chocoholic’ Bugbane is shorter than other dark purple Actaeas, but what it lacks in stature it makes up for in the beauty of its foliage. The leaves emerge in the spring as a dark bronzy purple and turn more green by mid summer. The fragrant white flower spikes tower over the foliage in the late summer, attracting all manner of pollinators. This is particularly attractive when paired with shade tolerant gold foliage plants. Consistent moisture is necessary for the best performance.